The battle on who gets the governorship ticket of the All Progressives Congress in Lagos State continued on Wednesday with the party leadership mounting pressure on the incumbent Governor Akinwunmi Ambode, to drop his second term bid and endorse his opponent , Babajide Sanwo- Olu. Sanwo- Olu came into reckoning in Lagos politics after he obtained the state governorship form last Tuesday and immediately got the backing of the Mandate Movement in the Lagos APC. The Mandate Movement is led by the National Leader of the APC, Asiwaju Bola Tinubu, who was Ambode ’s political godfather. The chairmen of the 57 councils had also declared support for Sanwo - Olu. 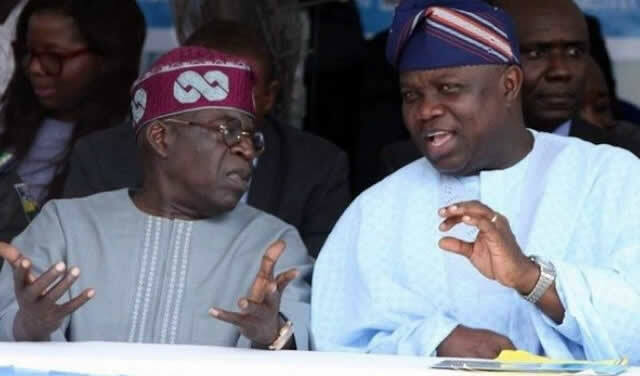 The governor and Tinubu have been in the news in the past few days because of an alleged rift over the second term bid of Ambode. Tinubu had refused to back Ambode’ s second term ambition despite pleas by notable people in the state and the country . Sanwo- Olu, a former commissioner in the state , on Sunday formally declared his intention to vie for the Lagos State governorship ticket of the APC , promising to restore the glory of the state when he was voted in as the governor . Notable APC leaders in the state , who were either allies of Tinubu or his followers, were at the declaration. On Monday , Ambode ’s wife, Bolanle had tried to save her husband ’s job when she met with Tinubu in Osun State and tried to pacify him to change his mind . The meeting did not yield positive result . Our correspondent learnt that both the state and national leaders of the party met on Wednesday and mounted pressure on the Lagos governor to accept the decision of the state party leaders . It was gathered that Ambode, however , told them that he would prefer to go ahead with the direct primary option of the party in the state. A source said, “Ambode was told to step down and forget his second term ambition . He was told to publicly endorse Sanwo- Olu as his successor. He was promised a ministerial appointment after the APC might have won the presidential election . He was even told to pick a ministry of his choice . Our correspondent also learnt on Wednesday that Ambode had instructed his camp not to speak to any journalist and wait for the electoral process to pan out . “We told him that he might likely lose if he decided not to fight back , but he just smiled ,” another source said. Also, it was gathered that the meeting of the Governor ’s Advisory Council, the APC’ s highest advisory political organ, which held in Lagos, did not discuss Ambode’ s issue . It was gathered that the body was supposed to advise the party on the choice between Ambode and Sanwo -Olu and its implication for the party. There had been reports that the verdict of the body would seal the fate of both Ambode and Sanwo- Olu. A source said the meeting merely took briefing on the three aspirants – Ambode, Sanwo - Olu and Dr Femi Hamzat – and later discussed Osun State governorship election . The body was also said to have advised the party to shift the primary to September 29 , 2018 , instead of the September 25 it planned to hold the primary. The source said, “Asiwaju , the governor, as well as the two other aspirants, were not present at the meeting . A briefing on the profile of the aspirants was taken and advice was given that the primary be shifted to September 29 .